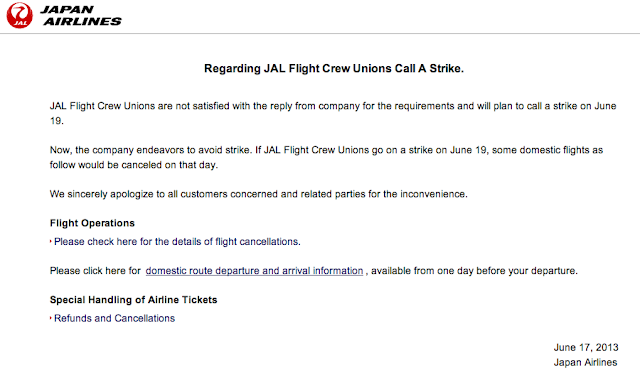 JAL posts a notice on its website informing passengers of the planned strike. JAL Flight Crew Union plans to strike for 24 hours on June 19 2013 as it is not satisfied with how Japan Airlines (JAL) replied to its demands. The planned strike will only affect domestic operations and as of right now, JAL has canceled some of its domestic flights on that day and has issued a special refund and cancelation policy. 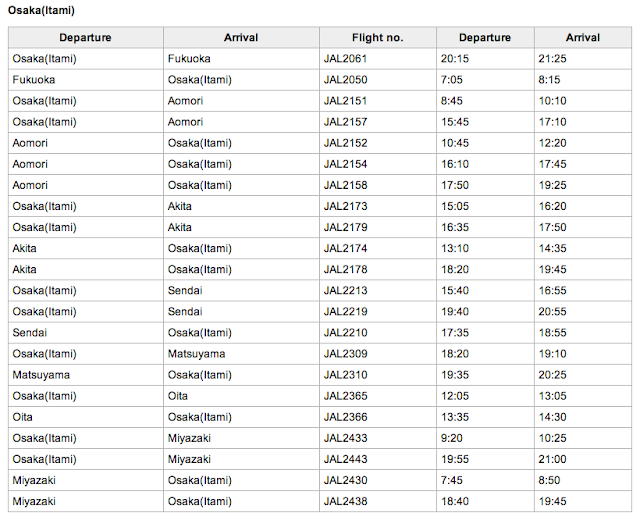 Only flights to and from Osaka Itami (ITM), Sapporo New Chitose (CTS), and Fukuoka (FUK) are affected. 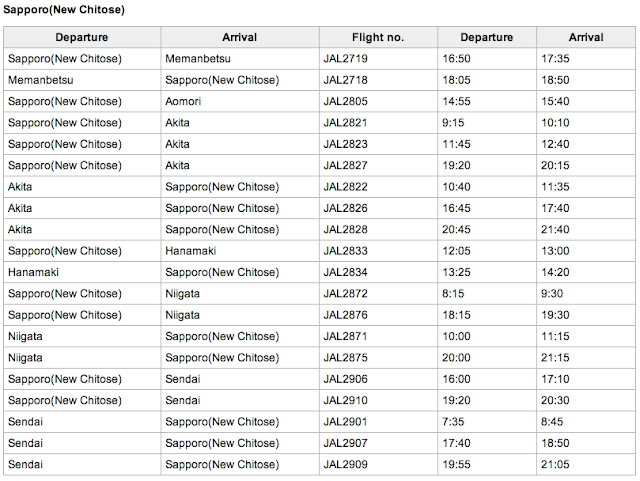 JAL is able to spare Tokyo Haneda (HND) and Narita (NRT) for now. As of right now, a total of 50 domestic flights, including 22 ITM flights, 20 CTS flights, and 10 FUK flights*, have been canceled preemptively. Below is the list of canceled flights. * Two of the cancelations are on the ITM-FUK route. That's why the numbers don't add up to 50. JAL flight cancelations at Sapporo New Chitose (CTS) caused by the planned strike. 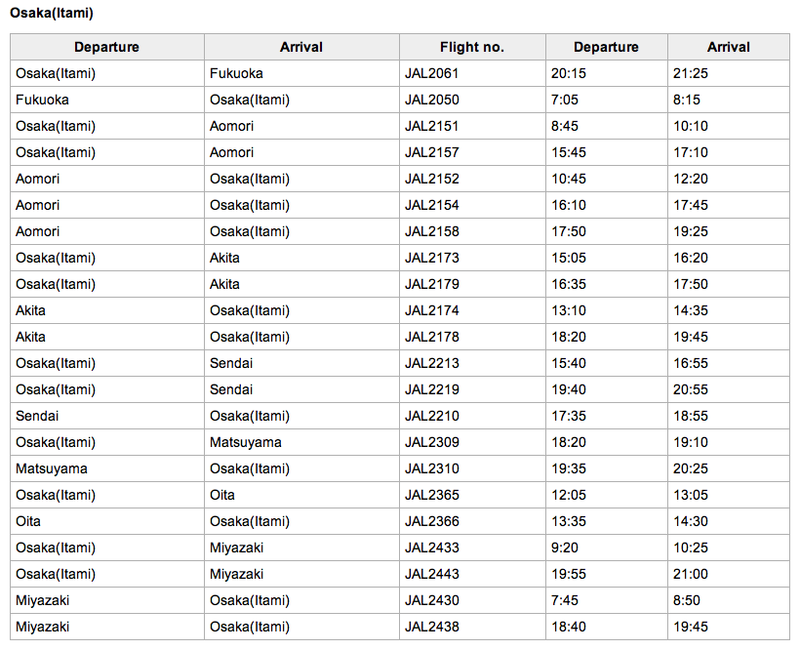 JAL flight cancelations at Osaka Itami (ITM) caused by the planned strike. 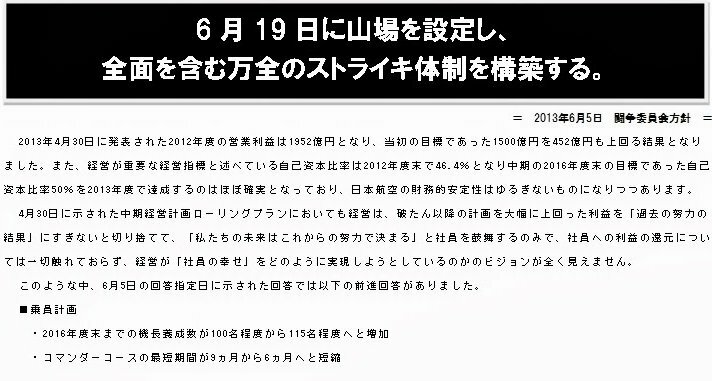 According to the JAL Flight Crew Union website, it has a total of 1,317 members as of June 11 2013. Its members consists of captains, co-pilots, cadets, and business planning staffs!? I have no idea why business planning staffs are part of the flight crew union. Maybe it only includes those related to pilots and operation planning? The union's demands are pretty simple. Basically it wants JAL to share its recent success with its employees. It believes one of the reasons that JAL could exceed its original forecast and goals significantly is due to the employees' efforts in the past. And JAL should encourage and inspire its employee by stop reducing their benefits, and try to improve their happiness. More specifically, it wants JAL to increase the number of captain training quota from the current 100 pilots to 115 by end of 2016, and reduce the minimum requirement for commander course from 9 to 6 months. The deadline for JAL to reply was June 5 2013. Sounds like JAL failed to satisfy these two demands and that's why the union has called for a strike. According to past experience, the union will usually call off the strike in the very last minute. But then by then the damage has been done as quite a few of the flights would have been canceled preemptively already. But there were definitely rare cases which it didn't call off the strike. But luckily, JAL (and ANA for that matter) is able to minimize the affected flights to its domestic network only and it only last for 24 hours. Then it will be business as usual the next day with passengers receiving the same excellent service. I hope the union will call off the strike again this time. We will find out in less than 48 hours.